GTX 970M Graphics: Unleash Your Gaming Soul The P55W v5 features a speedy NVIDIA® GeForce® GTX 970M graphics processor. A total package of 3GB VRAM handles higher frame refresh rate with ease and is capable of rendering more detailed graphics when running resource-demanding titles. Scoring P9000+ in 3DMARK 11, the P55W v5 with NVIDIA® GeForce® GTX 970M gives you a solid edge over other competitors while gaming. 6th Gen Intel® Core™ i7 Processor: Better Performance Through and Through. The new 6th Generation Intel® Core™ i7 processor features the Intel® Skylake architecture with 14nm process, giving you blazing speed and performance which will complete your computing experience. With this new boost in performance, you can do more on your laptop ranging from work to play. Never worry about the battery life as this chip consumes 78% less power than the previous 5th Generation Broadwell chip. Together with PCIe SSD, DDR4 memory, USB 3.1 Type-C and HDMI 2.0, Skylake allows you to start gaming right away! The 1080p Full HD display with great viewing angle realizes premium viewing experience plus astonishing color accuracy and crystal clear images when screen sharing. The Full HD matte display panel diffuses light and eliminates reflections, upgrading your viewing experience and creating the most realistic gaming experience. HDMI 2.0: Higher Frame Rate, Higher Potential The era of true 4K Ultra-HD is upon us! The untapped potential of 4K resolutions is realized through HDMI 2.0! Unlike HDMI 1.4 which only supports 8-bit color and 30 FPS, HDMI 2.0 can display games like never before! Supporting up to 18 Gbps transfer, the true potential of 4K resolution is realized through 12-bit color and 60Hz refresh rate! Finally see your favorite games how they were meant to be seen, in true high definition! *Requires HDCP 2.2 supported monitors. USB 3.1 Type-C: Upgraded Convenience The frustrations of turning a USB over and over trying to get it to plug has ended. With the introduction of USB 3.1 Type-C universal connector, connecting a USB is no longer a fuss. Not only is it easier to plug, it also has twice the throughput of USB 3.0, transferring 100GB video in as little as 80 seconds. Being able to transfer data faster and possesses much improved pluggability greatly improves any user's daily routine! Dolby Digital Plus™: Surround Sound Anywhere, Everywhere Dolby Digital Plus™ creates a realistic game-play environment that lets you hear every window smash, feel every explosion, and experience every wipeout as if they're really happening. Surround Virtualizer creates a virtualized surround sound experience of stereo or multichannel content over built-in speakers or over headphones. Whether you're playing games, watching Blu-ray movies, or streaming videos, your P55 is an awesome multi-entertainment hub when it has advanced Dolby Digital Plus™. Smart Dashboard Readies You for Any Challenge The best policy to win any game is to make sure your system is 100% with you. Smart Dashboard presents the real-time monitor on your system information, including CPU & GPU loads, temperature, fan speed, network conditions and power scheme. A simple glance is all it takes to keep track of how your system works. 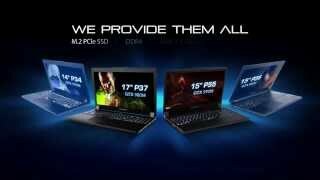 More links for "P55W V5 NVIDIA GTX 970M 3GB GDDR5, 15.6" FHD LED, Intel i7-6700HQ Gaming Laptop"